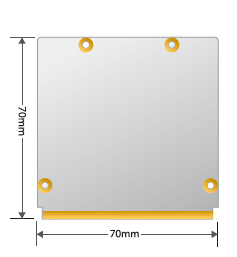 Qseven is built with a 70 x 70mm form factor, 1.2mm thickness PCB, 5-volt power input, limited power consumption under 12W, and limited overall height to approximately 9.2mm from the bottom surface of module PCB to top surface of heat-spreader. These mechanical and power specifications make Qseven suitable for small form-factor, mobile or battery target applications. 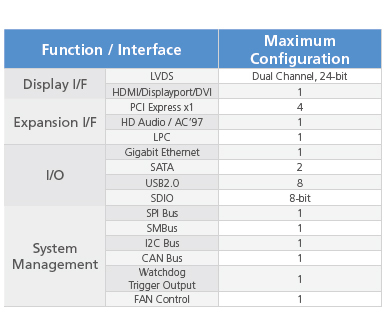 Qseven uses MXM as a board-to-board connector which is easy to get and cost effective, along with proven high speed integration for PCI Express. This small module provides digital display interfaces including LVDS, HDMI/Displayport, expansion interface PCI Express x1, and I/O like Gigabit LAN, SATA, and USB2.0. For size-crucial designs, Qseven provides the necessary functionality to minimize design effort for limited spaces.